As Joseph Smith was laying the foundations of Zion, his efforts to prophetically render ancient texts continued unabated. By 1831 Smith was revealing esoteric words that he said were from the prelapsarian language that Adam and Eve taught their children—a “pure and undefiled” mode of communication (Moses 6:5–6). 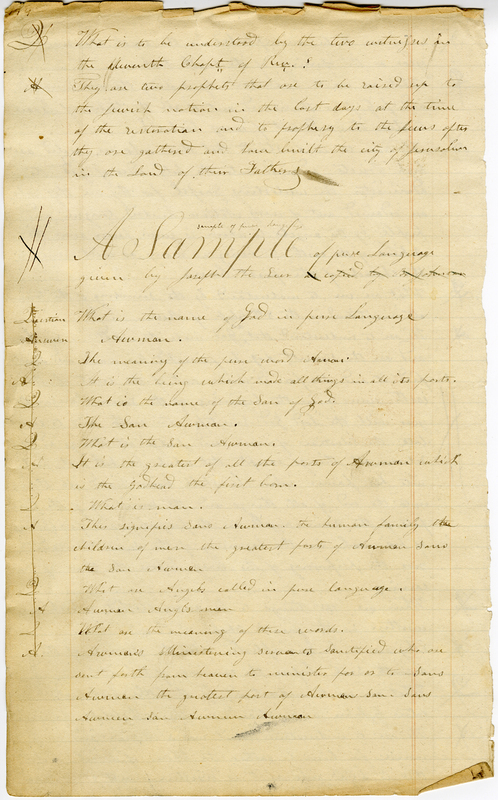 In 2009, the Joseph Smith Papers Project published for the first time what was thought to be the only extant copy of Smith’s Q&A exposition of “pure language” (circa March 1832, transcribed by John Whitmer). In a multimedia presentation at the 2014 John Whitmer Historical Association Annual Meeting, I analyzed a newly identified, second early copy of Smith’s “pure language” that had eluded historians for 180 years. Since delivering that presentation, I have located a third early copy of the revelation. These two new manuscript copies both elucidate and complicate Whitmer’s transcription, and are almost certainly more accurate renditions of what Smith initially dictated. Publication of a facsimile edition of “A Book of Commandments & Revelations” (a.k.a. BCR or Revelation Book 1)—a bound ledger transcribed by John Whitmer that preserves many of Joseph Smith’s early revelations—was a watershed moment for students of Mormonism. With the exception of a few pages owned by Community of Christ, the document was thought to no longer exist, and for good reason: Joseph Fielding Smith quietly kept it in a safe, and there it remained for decades. Among the gems historians discovered in the BCR were copies of revelations previously considered nonextant, including a “sample” of the pure Adamic language presented in a question and answer format (see figure 1) similar to (LDS) D&C 77. Smith issued both revelations ca. March 1832 (click the thumbnail images for hi-res pics). This revelation goes on to say that Sons Ahman are the greatest of all the parts of God excepting Son Ahman and Ahman, and that Anglo-man are the greatest of all the parts of God excepting Sons Ahman, Son Ahman, and Ahman, showing that the angels are a little lower than man. What is the conclusion to be drawn from this? It is, that these intelligent beings are all parts of God, and that those who have the most of the parts of God are the greatest, or next to God, and those who have the next greatest portions of the parts of God, are the next greatest, or nearest to the fulness of God; and so we might go on to trace the scale of intelligences from the highest to the lowest, tracing the [p. 343] parts and portions of God so far as we are made acquainted with them. Hence we see that wherever a great amount of this intelligent Spirit exists, there is a great amount or proportion of God, which may grow and increase until there is a fulness of the Spirit, and then there is a fulness of God. Scholars from the JSPP reasonably proposed that Pratt’s source was the BCR “or a copy similar to it.” The latter proved far more probable than the former. In my 2014 JWHA presentation, I introduced an early copy of the pure language Q&A that Pratt himself had transcribed in a personal notebook (see figure 2). Pratt’s 1855 sermon more closely parallels his transcription than Whitmer’s. 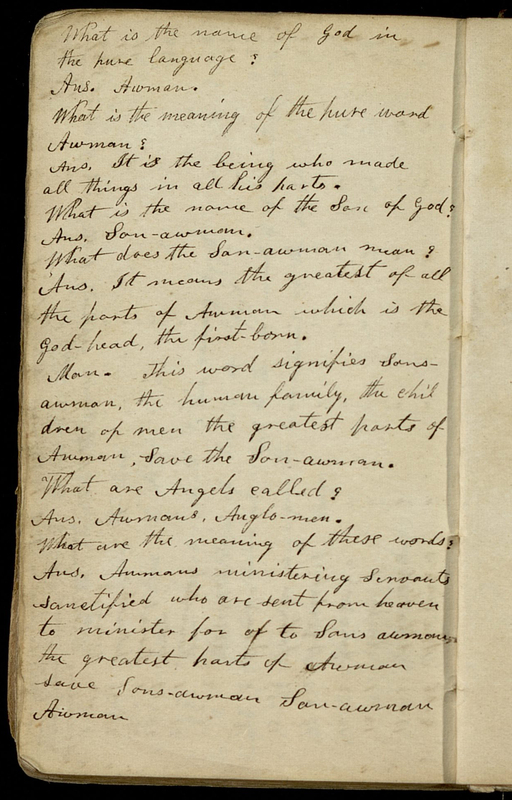 Several of Pratt’s variants find support in another copy of the Adamic Q&A transcribed by Frederick G. Williams who served as an official scribe for Joseph Smith from July 1832 to January 1836. 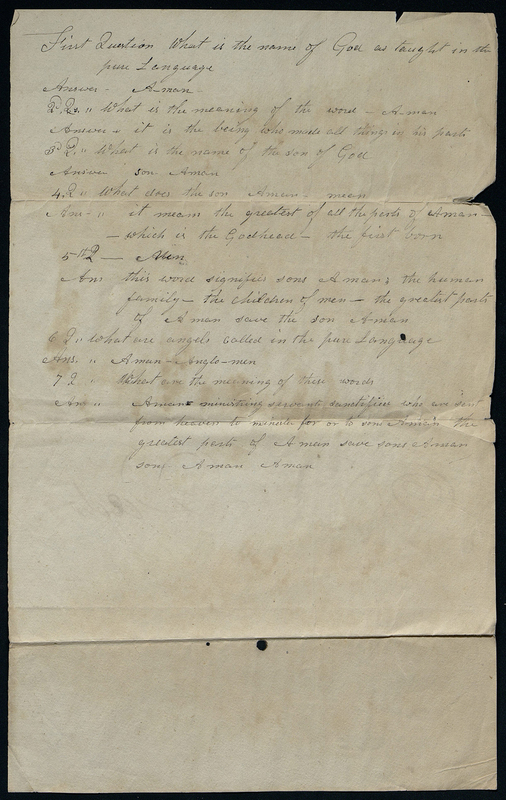 Williams independently recorded the revelation on a sheet of paper that he also used as a wrapper for an unknown number of property deeds (see figure 3). For a comprehensive analysis of the Q&A’s textual variants, manuscript provenance and dates, and function within Smith’s broader dictation story arc, see my essay “Eden to Egypt: Joseph Smith’s Quest for Adam’s ‘Pure Language’” (forthcoming in the John Whitmer Historical Association Journal). I’m asked with increasing frequency whether excavating Mormonism’s past is a worthy academic pursuit when it sometimes seems as if the most significant sources have been uncovered and analyzed. I hope this brief post invigorates researchers who have disruptive, transformative perspectives to scour virtual and physical archives for new sources and to re-vision old sources in ways that they’ve not been seen before. Revelation, circa March 1832, in Robin Scott Jensen, Robert J. Woodford, and Steven C. Harper, eds., Manuscript Revelation Books, Facsimile Edition, first volume of the Revelations and Translations series of The Joseph Smith Papers, ed. Dean C. Jessee, Ronald K. Esplin, and Richard Lyman Bushman (Salt Lake City: Church Historian’s Press, 2009), 264–65. Brent Lee Metcalfe, “An Early Copy of the ‘Pure Language,’” multimedia presentation delivered at the John Whitmer Historical Association Annual Meeting, Lamoni, IA, September 26, 2014. Two revelation books are included in the facsimile edition: the BCR (JSP, MRB:8–391) and the Kirtland Revelation Book (a.k.a. KRB or Revelation Book 2; JSP, MRB:412–665). For a key to symbols in the manuscript transcriptions, see “Appendix 1: Transcription Method” in Brent Lee Metcalfe, “The Curious Textual History of ‘Egyptus’ the Wife of Ham,” John Whitmer Historical Association Journal 34, no. 2 (Fall/Winter 2014): 11. “A Book of Commandments & Revelations,” page 144, John Whitmer scribe, LDS Church History Library, Salt Lake City, UT, transcription mine. See also, JSP, MRB:264–65. Orson Pratt, “The Holy Spirit and the Godhead,” February 18, 1855, Journals of Discourses, vol. 2 (Liverpool: F. D. Richards, 1855), 342–43. Pratt had recently visited the church historian’s office, examining “some old documents & revelations.” Church Historian’s Journal, October 20, 1854, CR 100 1, LDS Church History Library, Salt Lake City, UT; see Robin Scott Jensen, “From Manuscript to Printed Page: An Analysis of the History of the Book of Commandments and Revelations,” BYU Studies 48, no. 3 (2009): 43; Robert J. Woodford, “Introducing A Book of Commandments and Revelations, A Major New Documentary ‘Discovery,’” BYU Studies 48, no. 3 (2009): 14. Orson Pratt, notebook (circa 1834–36), penultimate leaf (verso), circa 1832–34, MS 4812, LDS Church History Library, Salt Lake City, UT, transcription mine (Pratt’s o’s and a’s are sometimes indistinguishable). Whitmer or a previous copyist may have mistaken the letterforms in save for sons in another’s handwriting. Whitmer acknowledges his dependence on a version “as copied by Br Johnson,” perhaps implying that Johnson’s wasn’t the original dictated manuscript. The printed essay will considerably expand my 2014 JWHA presentation. Brent, thanks for sharing this information. Fantastic work! And I think your advice is well taken: we shouldn’t make assumptions about what we *think* we have/don’t have, or what we think we understand/don’t fully understand in the archives. Lots of gems are still out there, and this is a great example. Smith’s quest to recover the Adamic language is one of those areas with great potential to shed more light on his thoughts and ideas. I’m looking forward to your forthcoming essay, ““Eden to Egypt: Joseph Smith’s Quest for Adam’s Pure Language.” Contextualizing Smith’s interests opens up very interesting windows into his worldview and intellectual pursuits. Thanks! I finally found time to read your post. I’m looking forward to the article! Excellent work Brent. I’m hoping your article will be out soon enough for me to use on a couple of writing projects I’m currently working on. Do you know when the article will appear in the JWHA Journal? I have a BoAbr/Eg-related essay that’s slated for publication in the spring. I’m concurrently working on my essay on JS’s Adamic but the publishing schedule has pushed it out to late summer or early fall 2016. JS’s Adamic appears in several contexts in early Mormonism such as laying the cornerstone for the Independence, MO, temple in 1831; dictating the Egyptian project in 1835; and unfolding the temple endowment in 1842. Your comparison of Adamic to speaking in tongues isn’t far from the mark—I’ve occasionally referred to JS’s “pure language” as a written form of glossolalia. Nice to have folks from reddit participating. My reddit ID is /u/Brent_Metcalfe (used reddit for the first time today). Brent, Thanks for sharing this. Your finds are certainly a good reminder that there is always more to be learned in Mormon history.